Linda Mace spoke at our ladies Club lunch meeting, bringing samples of all the products for the ladies to try. 'Amazing' said one lady as she used it on her dry lips. 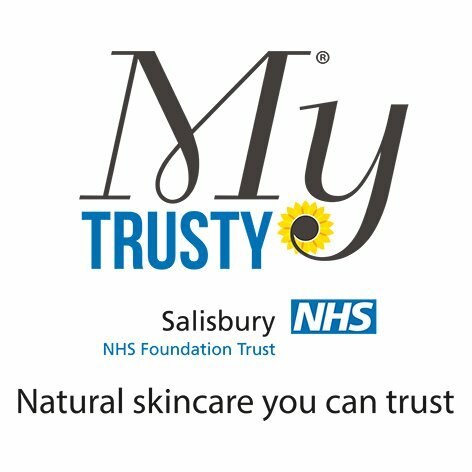 My Trusty® family skincare you can trust developed by Salisbury NHS Foundation Trust, offers a top-to-toe skincare solution, safe to use on all ages upwards of 8 weeks old – and what’s really nice is that all profits are reinvested back into patient care! The products were developed as a direct solution to painful itchy skin experienced by patients attending the Tissue Support Clinic in the Plastic Surgery and Burns Unit of Salisbury District Hospital during the 1980s. Many years ago, the only cream being used was an emulsifying wax which dragged the skin on application, resulting in additional discomfort to patients. The Tissue Clinic was focused very much on alleviating the build-up of scar tissue and avoiding contracture following surgery. To improve patient care, Salisbury Hospital skin research scientists investigated and observed different skin conditions on patients. They noticed that bowel patients had poor quality skin which they found was due to a lack of linoleic acid in their diet. Scientist Peter Shakespeare and his team learned that a rich source of this missing acid, that cannot be made in the body, could be found in sunflower oil. Therefore a formula was developed using 5% high grade sunflower oil as the primary ingredient, blended with a natural lightweight, easily absorbed cream. The response from patients was almost immediate. The new innovation effectively resolved dry skin conditions for up to 24 hours at a time, with the appearance of scars being diminished through regular use, making this a popular choice with clinicians and patients. Trying the oil, cream and body butter range was an insight to how moisturising this range is, and whilst we are aware of a fresh smell, its a natural hint of lavender or the sunflower oil aroma. A very pleasant experience and Linda was very enthusiastic promoting this beautiful worthwhile cause. On a personal level, I have been using the cream on one of my feet as it is constantly dry, itchy and cracked. Would you believe it's all gone so I can highly recommend using it and will continue to do so.